Mexico’s recent energy reform opened a purely state-run oil and gas sector to private investment. It wasn’t easy: in Mexico, corruption sensitivities are high, and opposition to reform from politicians, civil society and the general public was sometimes fierce. Now the autonomous National Hydrocarbons Commission (CNH) is charged with guaranteeing accountable, transparent bidding and contract management processes for new private actors in the sector. CNH’s purview also includes Petróleos Mexicanos (Pemex), the state-owned entity that solely ran the oil and gas sector for over 70 years. It is a difficult, complex mandate, but CNH president-commissioner Juan Carlos Zepeda’s ambitious goal is to go “above and beyond” international transparency practices and to foster public trust in the body. Since 2016, NRGI has acted as an informal advisor to CNH, analyzing global best practice and benchmarks in regulatory transparency with the aim of developing a culture of openness and tying together sources of information from across the labyrinthine oil and gas sector. CNH tapped NRGI to help to bring together a civil society coalition to monitor the regulatory agency’s progress in implementing its recommendations. In January 2017, NRGI delivered a comprehensive report to CNH that provided specific recommendations regarding the disclosure of key commercial, environmental, social and beneficial ownership information, facilitating citizens’ understanding of the sector. The report included advice for ensuring disclosure that applies equally to Pemex and the private sector. Additionally, a multi-stakeholder panel comprised of NRGI experts and CNH leadership presented the report to an overflow crowd at the regulatory body’s headquarters in Mexico City, helping build an information bridge between CNH and the public. NRGI convened a civil society coalition that is empowered to monitor CNH progress in meeting and exceeding report recommendations. NRGI has committed to work with civil society organizations to hammer out points of collaboration. 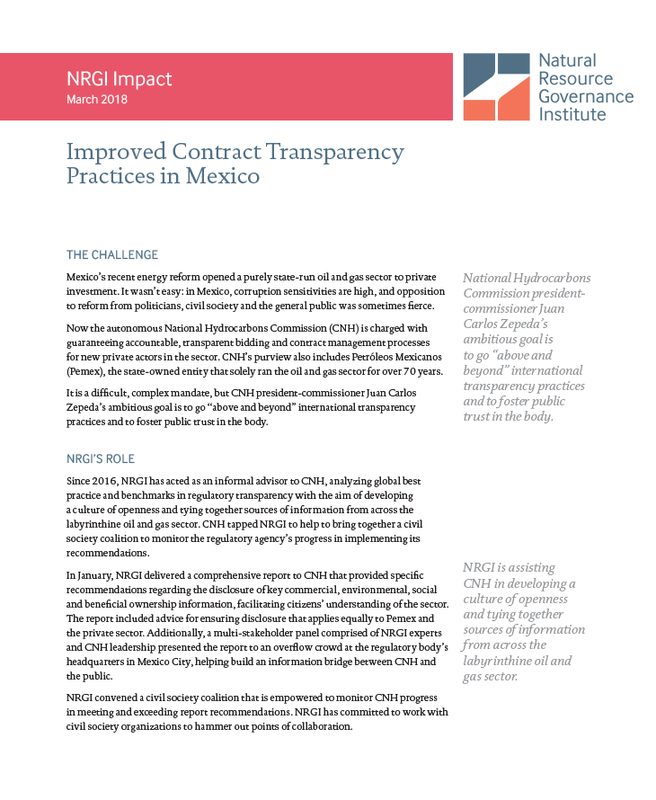 NRGI’s research and guidance has helped CNH take important steps toward improved transparency. CNH now ensures that information on the process of each bidding round is public and online on a recently revamped website—contracts, annexes, the name of companies involved at each stage of the bidding process and all progress in the bids can now be tracked and understood by outside parties. Contracts with foreign oil companies have also been made fully public, as have the investment plans companies are pursuing to bring assets to production. NRGI experts continue to actively engage with CNH. For example, NGRI pointed out that a draft of a CNH report failed to mention that no information related to entitlements for Pemex was publically available; CNH subsequently incorporated this observation into the final draft of its report and has used it to pressure Pemex to provide more entitlements-related data.